Weather Sensitive Pain - Fact or Fiction? - Piedmont Physical Medicine & Rehabilitation, P.A. 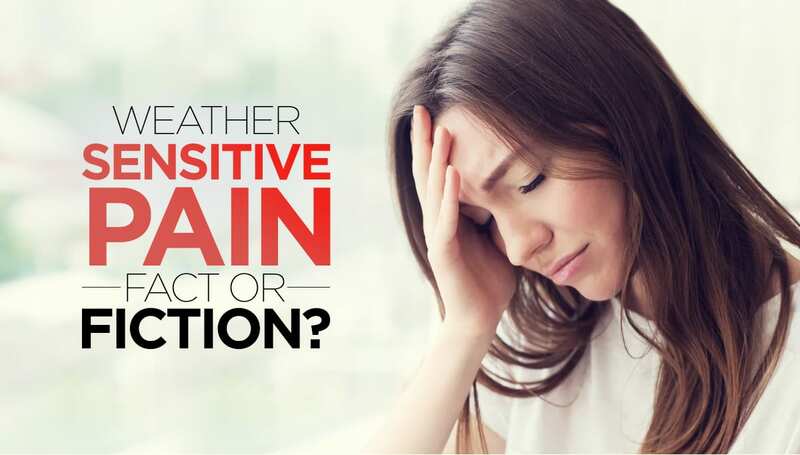 Weather Sensitive Pain — Fact or Fiction? Chances are, you’ve heard at least one person talk about having “bad weather aches.” Unlike regular chronic pain, weather sensitive pain seems to flare up with changes in the weather. To the average person, there doesn’t seem to be any rhyme or reason for it — how can the weather cause someone pain? Is it an old wives’ tale? The truth is, weather sensitive pain is all too real for the people suffering from it. What triggers weather sensitive pain? Many people assume their bad weather aches and pains come from bad weather, like rain, cold fronts, and dark cloudy days, but, for the most part, there’s a completely different culprit – barometric pressure (atmospheric pressure that indicates the pressure exerted by the weight of the air in the Earth’s atmosphere). Typically, people experience pain when the pressure is falling, but it is not impossible for them to experience pain from rising pressure either. The reason pain most often correlates with bad weather is that falling barometric pressure usually means a rain or cold front is on the way. Sometimes the sympathetic system just does not work right. Sometimes it just goes wacky. When that happens during a period of falling or low barometric pressure, the sympathetic nervous system may cause you to have intense pain; pain in pretty much in any part of the musculoskeletal system, especially ones that have been injured. Pain that’s worsened by cold often responds well to heat, in the form of heating pads or Epsom salt baths. For some sufferers, stretching exercises can help reduce their pain and improve their mobility. Over-the-counter or prescription pain medication may help relieve temporary pain, but generally the best strategy is to improve circulation in the area with the goal of increasing blood flow. For people who don’t respond to home remedies however there is hope. We offer several treatments to manage weather sensitive pain, including the use of specialized medications and several other options that can provide relief without having to resort to medications. While people who don’t suffer from weather sensitive pain may scoff at the idea, we know that it is very real and how it can have a terrible impact on quality of life for those who have it. Fortunately, there’s no need to suffer through bad weather induced aches and pain or to only rely on ineffective treatments — at Piedmont Physical Medicine & Rehabilitation, we can help people with severe weather sensitive pain lead happy, normal, and productive lives. Call us today at 1-864-235-1834 for an appointment to begin your journey toward pain-relief.